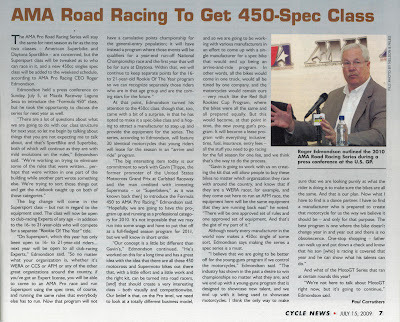 AMA Adds 450cc Singles Spec Class for 2010… Possibly. Here at Roland Sands Design we always knew the 450 SuperSingle was an undiscovered monster. And now it appears as the AMA has caught on to the advantages of the motorcross/race-bike conversion. 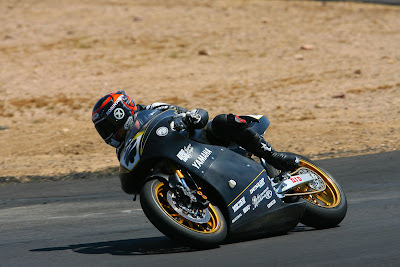 The AMA announced at Laguna Seca that they may introduce a 450cc Singles Spec Class for the next season. While the particulars are still being worked out, RSD has long known that it was only a matter of time before they made their way into the mainstream. For more information on our 450s please visit rolandsands.com/450.html. Cycle News announced the addition in their most recent issue. Click the image below in order to see it in a larger format.